There’s a Piazza in Rome with a small pizza house in it called “American Pizza Company”. It always makes me chuckle whenever I walk by – the terms “ice to eskimos”, “coal to Newcsatle” and “pizza to Roma” all imply the duplicative, perhaps unwanted and inferior activity of taking something to somewhere where there’s already plenty of it there. Now, while Americans don’t (Chicago pizza aside) have much to teach the Italians about making pizza, they did invent an interesting variation called a “Calzone”. When we in the west adapt a food item from another culture we instantly give it an overly authentic name, hence “Calzone” – can’t sound more Italian than that. We British did the same thing with Vindaloo – a fictitious “Indian” curry based upon, of all things, a Portuguese recipe. Anyway, while there are plenty of vegan pizza recipes around I thought it would be fun to set about creating a vegan calzone recipe, in honor of the American Pizza Company which serves a damn good, albeit non-vegan calzone. 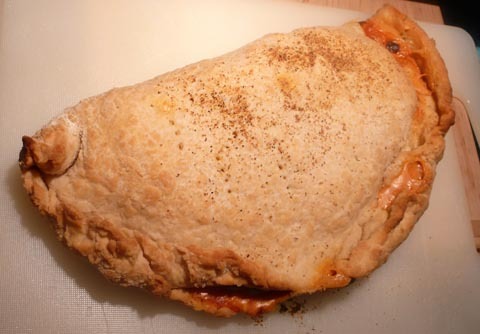 A calzone is basically a pizza folded in half with lots of extra ‘toppings’ tucked inside. The secret to a properly prepared calzone is to get the crust just right, and then shove in as many toppings as you can without the thing bursting or leaking while it’s being baked.